Does the word relationships indicate an impossible teaching nirvana? One of my favorite edu-speakers is Todd Whitaker. He often says “If you want to change student behavior, you need to start by changing adult behavior.” Many schools begin the year chanting the mantra of relationships. Some even develop a relationship theme or move from a behavior policy to a relationship policy. While those are certainly moves in the right direction, I still fear many teachers simply regard this as a shift away from student responsibility. I wonder if they feel threatened by the language that suggests some impossible teaching nirvana, a nirvana that fails to address “Barry” that is seated in the back breaking pencils. In reality, we need reminded that students don’t want dramatic displays of affection or one-off events to build relationships on day one. They don’t want our personal life poured out, they don’t want a social media connection, and they don’t want to stop by for tea or coffee. We need to remember the drip effect. It’s the steady, daily acts of care that yield the largest gains. It’s the high five in the hallway, the eye contact as we walk through the cafeteria, the 20-second conversation by the busses, the positive phone call home, or the handwritten note dropped in a locker. As adults, we generally steer clear of people who want an instant relationship. Imagine the person you meet in the grocery store line that invites you and your spouse on a 7-day cruise to the Bahamas. Too much too soon is awkward! Relationships grow with steady drips, not in a hour-long assembly or one lesson involving paint and slime. In the adult world, it’s the kind word at the door as you enter school or the thinking of you text message that strengthens a positive relationship. Those same strategies work with kids. Great teachers invest emotional currency on purpose. They know the smiley face they put on that paper, or the stamp they stick on a child’s hand, or the game they stayed late for is a worthy deposit of emotional currency. That currency can be cashed in to avert a crisis or deescalate a tense situation. Great teachers know that the toughest students may have one person at their school that they’ll talk to when things go from bad to worse, and that one person is me. I had to discipline, now how do I recover the relationship? I’ve been blessed with some opportunities to speak and write about prevention. It’s true, the best classroom management strategies are founded on prevention. Stop the behavior before it starts. I fully endorse the writing of handwritten notes. I’ve blogged and spoke a lot about my 3-pronged approach during the first week of school. Seek out those tough kids like a shark. Find something positive during the first week of school. Recognize it publicly, write a handwritten note, make a phone call home, hold a short conversation somewhere outside the classroom, etc. There are a number of ways you can make positive contacts with tough kids during the first week of school. The entire philosophy of SAMS and COSTCO are built on positive touches with customers. Research suggests that it takes 7 positive contacts for a customer to return. This post is intended to provide support to those teachers who may or may not have done that, but still have to deal with what we all may face: I still had to discipline that kid. I would never advocate against the use of discipline. 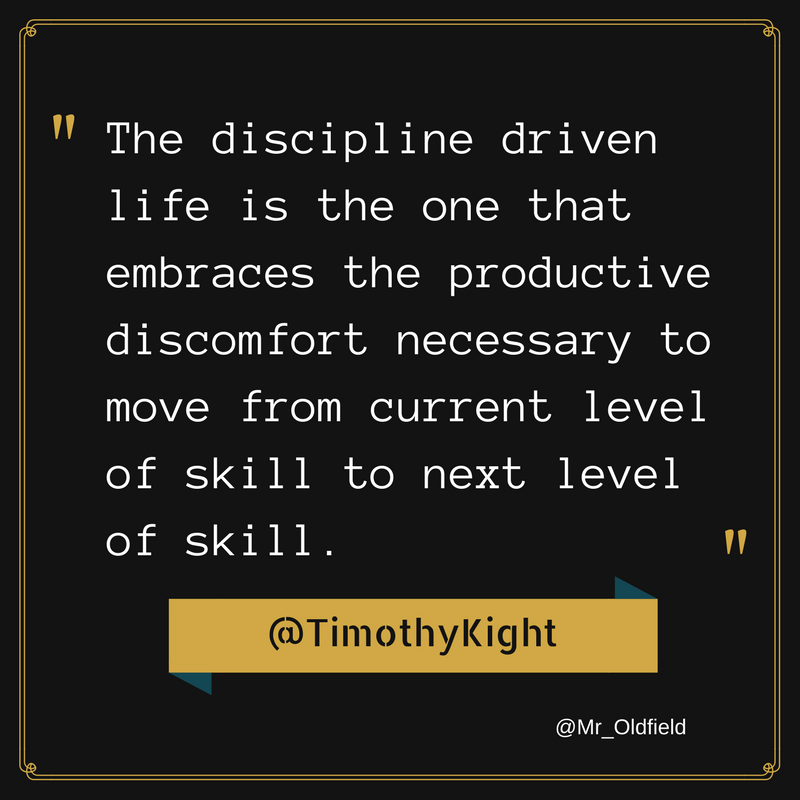 I’m a big supporter of restorative practices, but I know in all schools, we still have to support teachers who had to utilize a form of discipline. 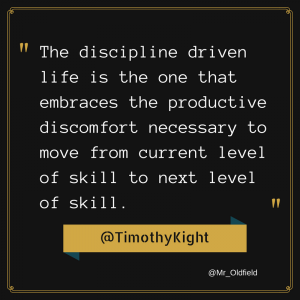 In the case where we’ve invested a lot of time and energy into a student, it can be a real challenge to recover a relationship once we’ve had to resort to a form of discipline. So let me lay out a common scenario: Jared was a tough student last year so you anticipated him being a tough student this year when you noticed him show up on your roster over the summer. You invested in positive tools that seemed to yield some effective response in Jared. He seems to be putting forth more effort for you in your class. The investment you made in connecting with Jared’s heart seems to have paid off. For some unknown reason (there’s almost always a reason, recognize the feedback), Jared has a terrible day in your class. Perhaps he even has another terrible day tomorrow. Whatever the case may be, you have to report Jared to administration and schedule a meeting. Know this, despite the magnitude of your efforts to turn Jared around early in the year, the relationship between you and Jared is damaged. That’s not to say you did anything wrong. That’s not an indictment on your use of discipline. It’s just a fact. The relationship is surely to be damaged. It’s irresponsible for us to expect Jared to return to our class with a renewed spirit, ready to reengage in learning with a respectful attitude. That would be nice wouldn’t it? See, some kids may do that. I’m not talking about those kids. 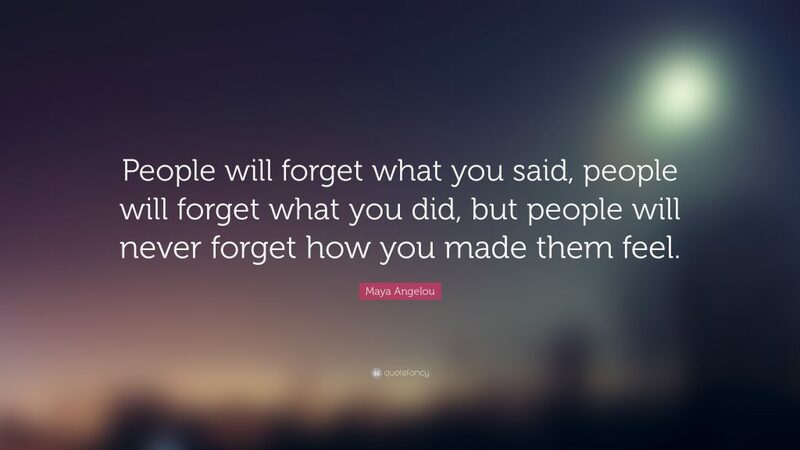 If you’re reading this and can’t seem to recognize which kids I’m talking about, consider yourself fortunate to have worked with a different kind of student. In my position as an administrator, I’ve had the privilege of working with teachers and spending time in other classrooms. I didn’t have these opportunities as a classroom teacher. Since then, I’ve noticed that a lot of teachers may make an effort to invest in preventative strategies, but a lot of teachers still struggle when it comes to recovering, renewing, and restoring a relationship that may be damaged after discipline occurs. 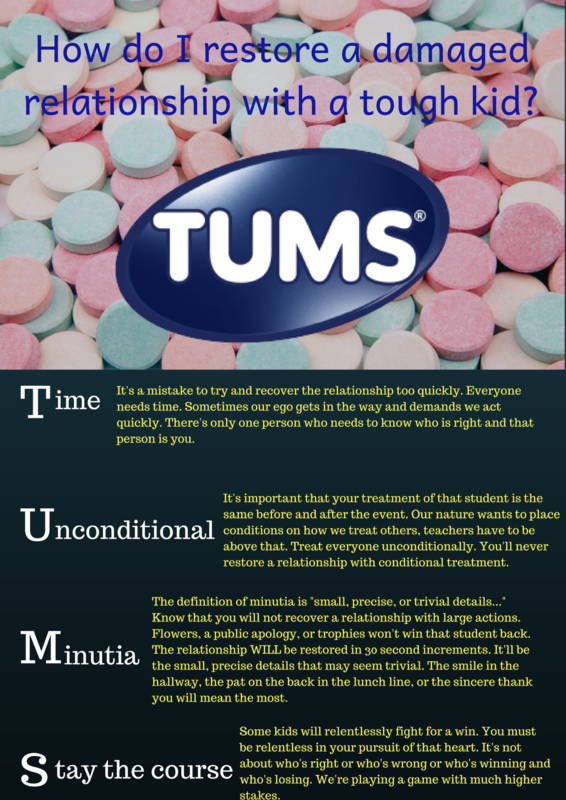 I created the following strategy to help inspire and guide teachers in restoring positive relationships with kids. You Want Me to Be LESS Human? The high schools in my county are undergoing a full 1:1 implementation next school year. The lower grade levels are already 1:1. You want me to be LESS human? Isn’t that a common concern when teachers are suddenly facing a huge influx of devices? I see it on teachers’ faces and you can likely hear it in the hallways after faculty meetings. It’s a common misconception and one that needs addressed via high quality learning experiences for teachers. I like taking the example Sal Khan, of Khan Academy, gives us in a popular Youtube video. He explains that even he wouldn’t want his own children sitting in front of a computer all day with little support from a teacher. It’s true, Khan Academy does offer that experience to children in third world countries who lack the support of a trained professional. But, the benefit of blending instruction through the use of technology is really about making teachers more human. I often use myself as an example. Years ago I spent x number of minutes each week calling out correct answers to homework. I used the trade & grade method. I passed out red pens, called out answers to homework problems, had the students right a percentage on the top of the paper, turn it in, input grades, and begin class. Even if I gave homework twice a week, that’s still a large chunk of time that really isn’t very valuable. 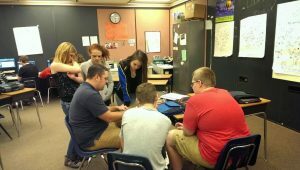 I replaced that time with a lot more time spent down on a knee with groups of students or one student working directly with them as they worked out problems. A lot of my whole-group instruction (I used to have students take notes, replaced that too) became more effective small group instruction. It’s amazing how much better students listen if you’re instructing a group of 5 rather than a group of 25. Here’s a great workshop for teachers: “Close your eyes and visualize a snapshot of time in your class in any given week. 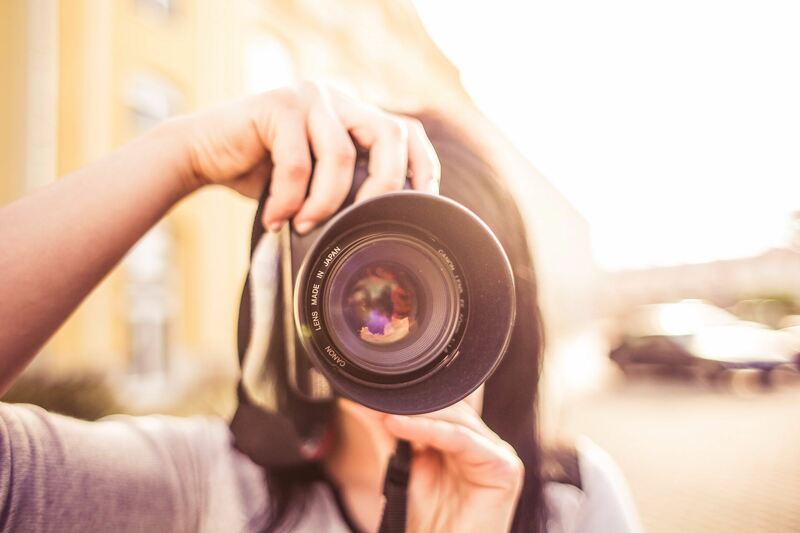 I want that snapshot to be the time that you would consider the HIGHEST quality in terms of learning. If you could press pause at any given moment, what would your moment be?” What follows is an excellent discussion. Ask teachers to describe that moment in detail. What is the teacher doing? What are the students doing? What does the room sound like? Who is speaking most? You can even follow that conversation with “what would your worst moment be?” and discuss that. Blended learning is really all about making teachers MORE human, not LESS human. Standing up front of a class reading a powerpoint while students are passively writing down notes isn’t high quality time in terms of learning. It MAY be necessary but it’s not high quality. 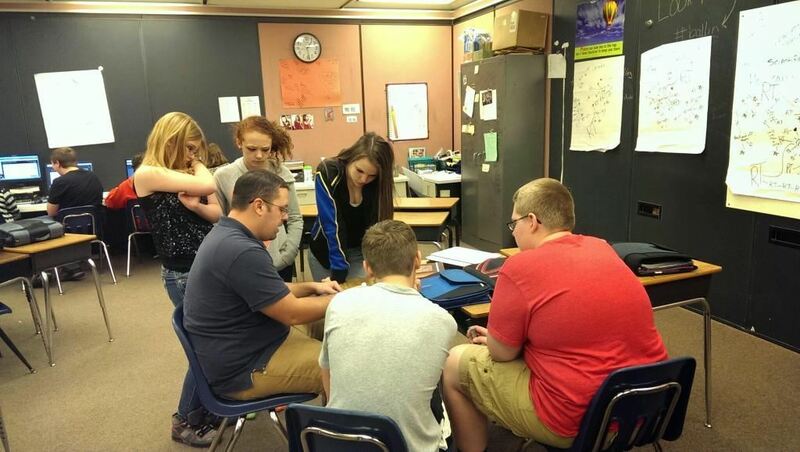 Blended learning is taking the highest quality time and making more of it. Ask any educator what their focus is and I imagine most would tell you the focus is always: learning. Yea, that’s got to be the most common answer. Yet, if you take a look at some common practices through the lens of learning, I think it would reveal a blurry focus, at best. Here is a list of common classroom practices that we should all reconsider this year. 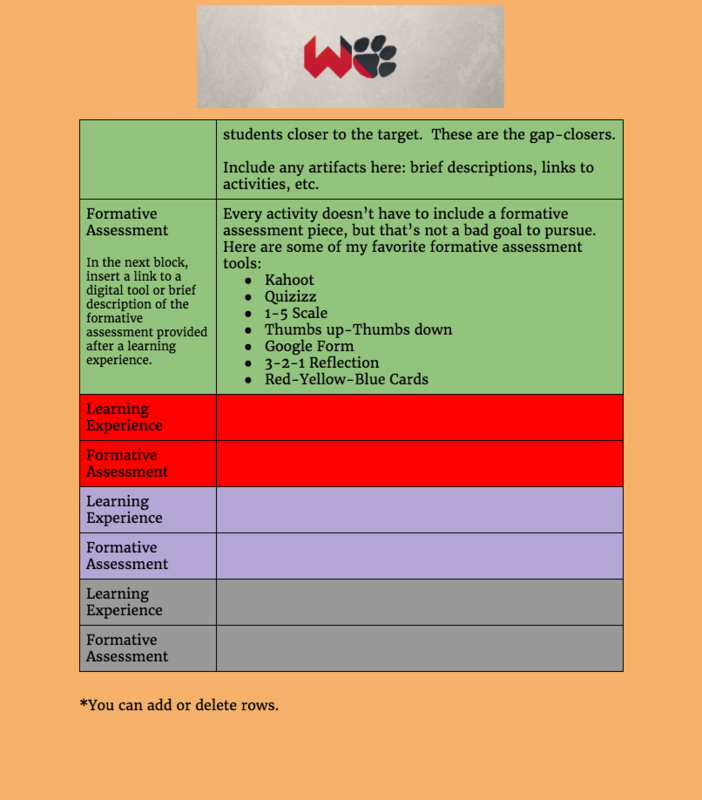 If you’re brave enough to reconsider these practices, you’ll find yourself taking steps to bring the focus of your classroom on learning. Extra points for limited bathroom trips. If you’re students claim that mother nature calls every day during your class, giving extra points in an effort to stymie mother nature is definitely blurring the focus in your classroom. Especially in the secondary level, school is too often viewed as a game to students. Those who win are good at leveling up, collecting extra points, and taking advantage of silly bonuses like this one. Great teachers don’t have to give extra points to keep kids from hiding in the bathrooms during their class. Handing out participation points. So you say the focus is on learning? Do you know what those daily participation points do to a student’s grade? The answer many teachers would give is just unfortunate: it gives some kids a boost at the end of the grading period. That response is not one that reflects a focus on learning. It reflects a focus on giving As. Stay with me till the end here. Detailed rubrics for A-B-C-D-F handed out in the syllabus at the beginning of the year. I know what you’re thinking, “hey now, I’m just being clear about what it takes to get an A.” You are clear, and now the game is on. I guess it’s possible to clearly state your tolerances for mastery in a detailed rubric like that, but I haven’t seen one. Far too often I find those rubrics have the silliest language about numbers of sentences, numbers of problems, time spent on _____, etc. So what is more effective than those practices? I’m no psychologist but I think a lot of times the thing that blurs the focus in many classrooms is the teacher’s need for control. You can sharpen the focus on learning by giving up control. It almost sounds like an oxymoron doesn’t it? It may sound scary too, but it’s true. 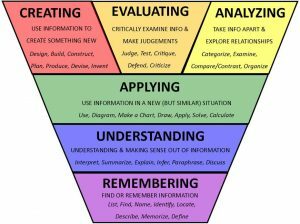 Instead of detailed rubrics spelling out the limits for A-B-C-D-F, let’s be sure your grades reflect evidence of, you guessed it, learning. What evidence of learning does a participation grade reflect? If teachers are brave enough to look in the mirror, they’ll eventually admit that participation grades are used as a classroom management tool to bait students into participating in their class. Think about it, the only way you can get kids to pay attention is to hand out points for it? Sitting quietly and breathing doesn’t reflect learning and it shouldn’t impact a student’s grade. I’m not suggesting you keep the requirements for an A a mystery till the end, but classrooms with a true focus on learning put the responsibility for establishing the bar in the hands of the students. 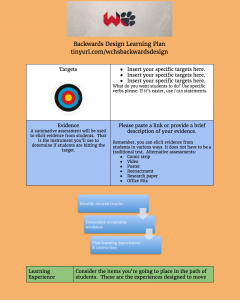 Classrooms with a focus on learning have clearly defined learning targets that students can articulate. 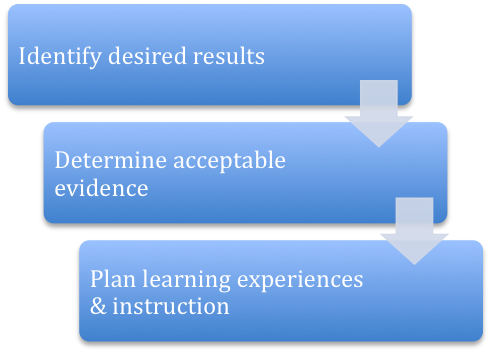 The tests align with those pre-established learning targets. Here’s a challenge for you, during your next class, ask your students what mastery would look like for any of your learning targets. Can they articulate it? 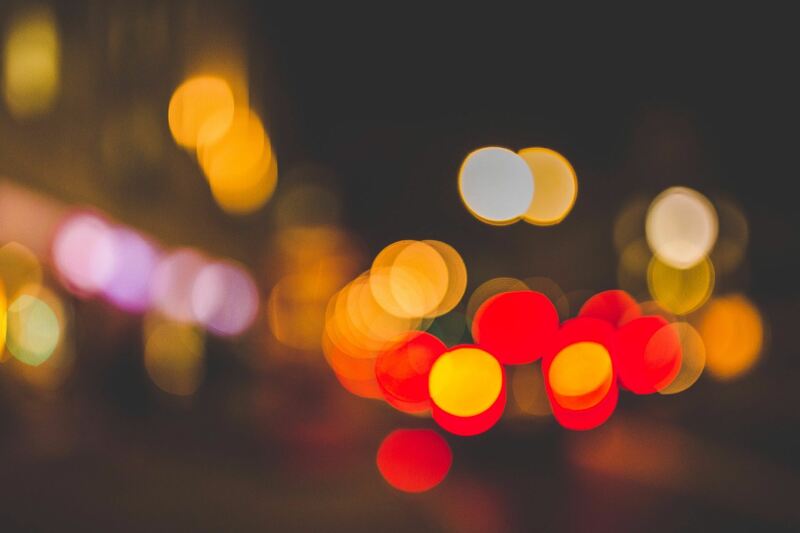 If not, the focus is blurry. 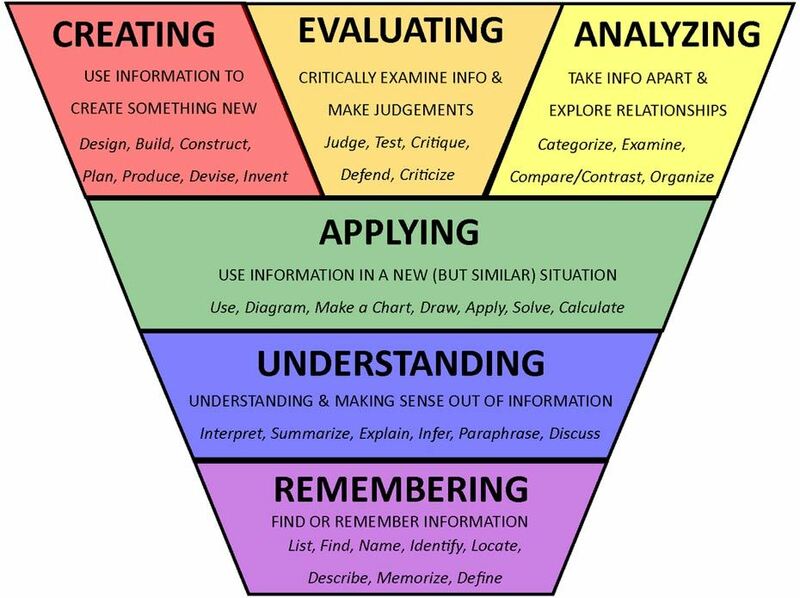 If your students can provide evidence of what mastery would look like, your focus is on learning. When your students complete an assessment, do they get an opportunity for a retake ? Is their actionable descriptive feedback provided? If not, the focus isn’t on learning. I’d love to hear from you. Leave a comment or a tweet about your thoughts. 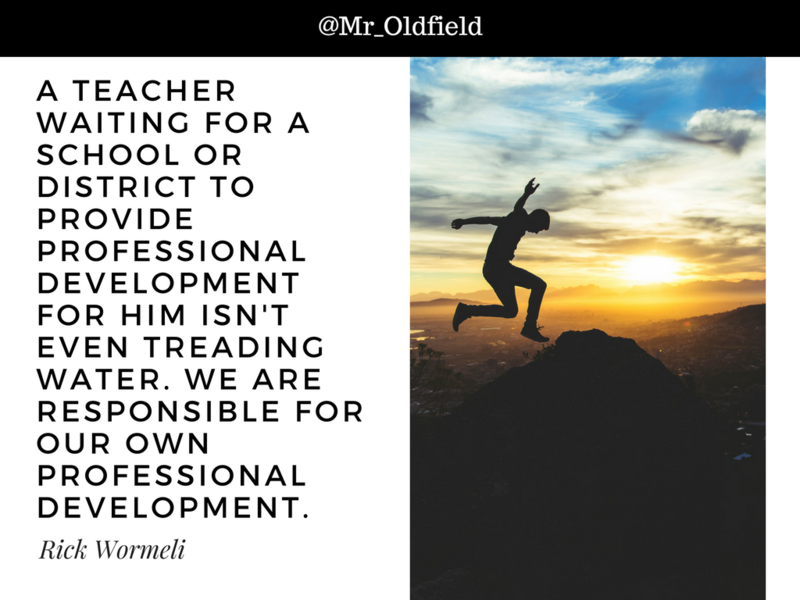 I want to arm school and district leaders with ways they can engage their participants before their PD events in order to generate excitement, ignite the conversation, and spark momentum heading into their professional learning experience. Flipgrid is on fire! 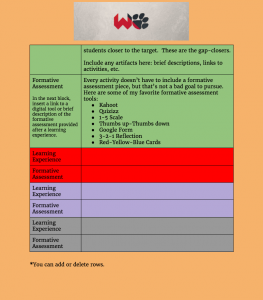 Matt Miller put together this awesome blog post including 15 ways Flipgrid can be used in the classroom. Consider this number 16! I launched a Flipgrid topic to the #wvedchat network recently. West Virginia’s statewide technology conference is coming up July 18 and I used Flipgrid to encourage conference-goers to record a short video response sharing what they are excited about for this year’s conference. We’ve received some great responses so far and you can view them or respond here. 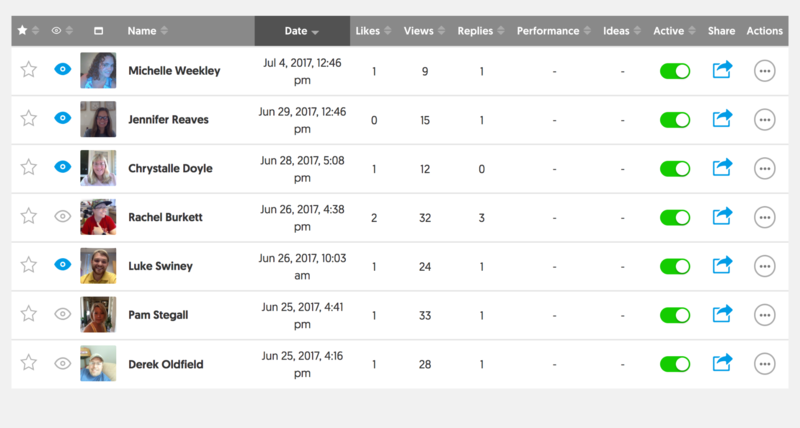 Consider using Flipgrid to generate some excitement leading up to your next professional development event. Your session leaders could even record a mini-commercial detailing what participants will learn by attending their session. 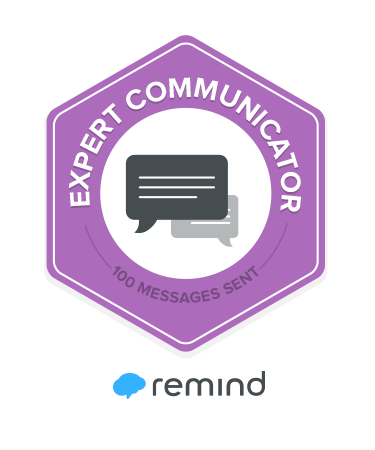 Or you could use Flipgrid after your event to collect feedback or testimonies about what your participants will take back to their classrooms and schools. Finally, you could require participants record their video response in order to be entered into a door-prize drawing during your PD event. Flipgrid offers a great opportunity to increase the energy heading into your professional development sessions. Every conference or professional development event should be using a backchannel. Recently, I was fortunate enough to follow the learning at two huge educational conferences by following the conversations across the conference hashtags: #ISTE17 & #ModelSchools. I’ve never been to either conference, though they’re definitely on my edu-conference bucket list! School and district leaders have a great opportunity to model an effective instructional practice by encouraging participants to exercise their voice across the event hashtag. 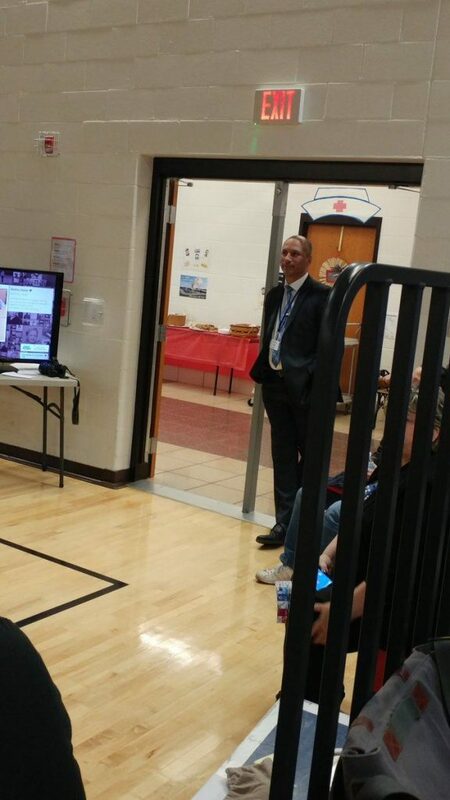 The hashtag also provides participants an opportunity to share their learning during the event. Using curation tools like Storify, educators can capture their learning during the event and use that archive as evidence of their growth during evaluation conversations with school or district leaders. I love what Dwight Carter did during Model Schools to reflect on what he learned during various sessions. You can view this reflection by clicking here. There are advantages to using Facebook and one of them is that nearly everyone is already there. Meet your event participants where they are and create a Facebook event for your professional development dates. You can use the comment sections in the event posting to generate excitement, provide thought-provoking questions, or preview some details about your event using pictures/videos. What do I do once I have damaged that relationship? This question was born out of a recent conversation with a student-teacher in my building. 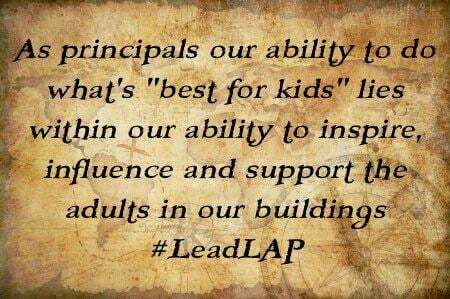 It was a great thought and one that every educator should be considering. I have to imagine that even the best managers of classrooms have messed up and damaged a relationship with a student before. We’re human, after all. So let’s set the stage a bit. That one student who has been tip-toeing the line for several days or even weeks, decides to jump over the line head first one day. The irritation overcomes you and you lay down some punishment. The next day the student comes in with a chip on his/her shoulder and you are forced to dig deep into your toolbox in a relentless search to engage that student, but your efforts are to no avail. So you’re left wondering, “how long will he/she come to my room with a negative attitude? Do I just let this student have his/her space? If I ignore them, I’m afraid they’ll just distract others.” Chances are, they will distract others. That student is seeking an audience and will do what they can to pull more students to their side (there are sides now, you know). So what do I do now? Let’s say for sake of this post, this student is Jeremy. This, in my opinion, is the best piece of advice I can offer to the teacher in this situation: DO EVERYTHING YOU CAN TO PREVENT MORE JEREMYS FROM APPEARING IN YOUR CLASS. Right now, you’ve only got one Jeremy. But, if you do nothing, more will appear. So what can you do to prevent Jeremy from multiplying? No doubt, in this situation, Jeremy already has some followers or at least some people that may be considering joining the fold. You better seek those students out like a Sidewinder missile! Now, you have to do more than identify them. Start recognizing anything even remotely positive that those students are doing in your class. “I appreciate how you came in and got your stuff out so you’re ready to go, great job man!” “Hey Daniel, I’ve never seen someone persevere over one problem quite like you have! Way to go!” “Chasity, thank you for picking that pencil up off the floor for me!” With each of those praises, you look them in the eye and dap, shake their hand, or high-five. Make a positive contact if possible. Next, go the extra mile. Don’t just rest on a positive praise that requires 5 seconds of your time. Write those students a handwritten note and deliver it to them. Make a phone call home and tell mom or dad how much you appreciate that specific behavior you observed in their child. You want those behaviors to continue, right? Then put in the effort. It’s worth it! Meet those students as they arrive at school early in the morning. Talk to them. If your schedule permits, see them at lunch and sit with them, talk to them. Great relationships with tough kids don’t happen by accident. If you’re willing to do the things few educators are doing, you’ll reach the kids few educators are reaching. If you follow through with these actions, chances are great that you have done well to prevent more Jeremys from appearing your class. Read my next post to determine what to do with the original Jeremy. We recently carved out 30 minutes of time for teacher learning every Friday around our lunch hour. These lunch & learn sessions are short, but they are what we have to work with at this point, so it’s been my challenge to maximize the value of these opportunities. I want to share just how we’ve been able to align and model a learning path that mirrors the path of learning for students. Our target has been to improve the way we measure and communicate learning. That’s been the driving force behind the opportunities provided for my teachers. With a clear target in mind, I decided to plan backwards and model this process throughout our time together. My plan would follow and align with the template I created here. This template will eventually be shared with my teachers. In fact, this template is the evidence that I’ll solicit from my teachers later. 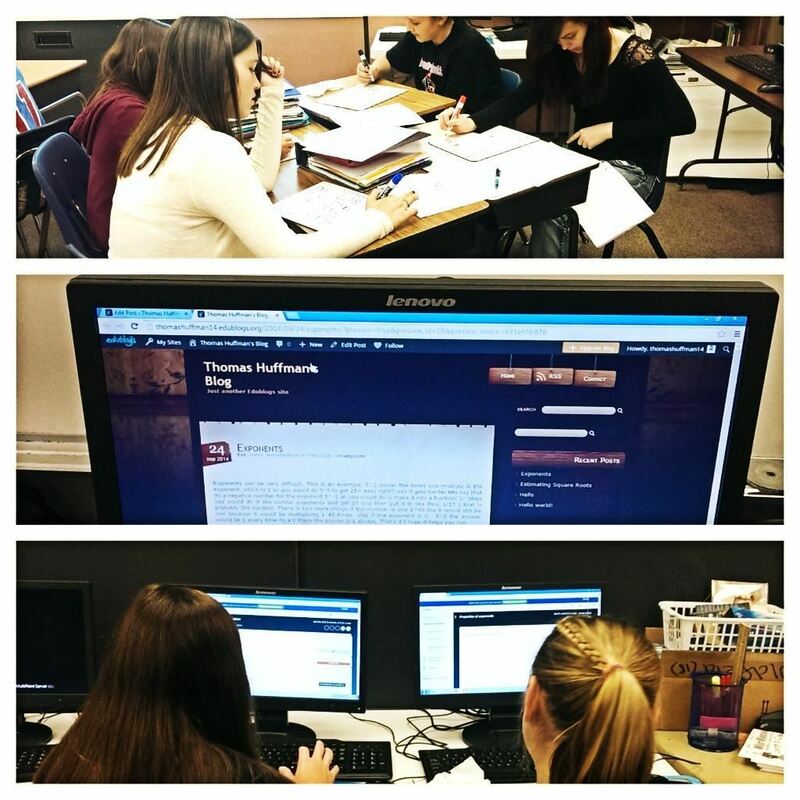 I identified needs through walkthroughs and various conversations with teachers. My school, not unlike others, has a lot of missing assignments, low motivation from students, teachers working harder than kids, and lots of grades. We have classic signs that point to a grading and assessment problem. Here is the document detailing our learning path as a staff. I would love your feedback on the plan. Feel free to ask any questions. This is a collaborative blog post from Derek Oldfield, Jodie Pierpoint, and Paul Bailey. Paul Bailey, Jodie Pierpoint, and I are in a Voxer book chat group reading Kids Deserve It with some other friends. The three of us were Voxing each other recently about developing authentic relationships with students. Born out of our conversation is this fun challenge we considered posing to our PLN via Twitter. 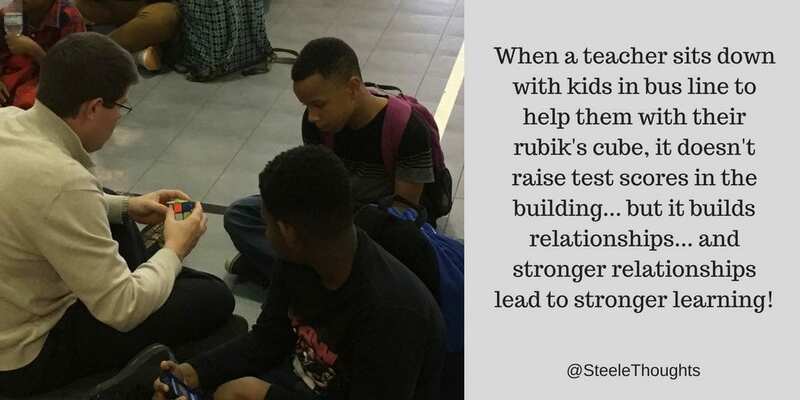 Our purpose is to get more educators engaged in the extra effort that is required to build true relationships with tough students through positivity. 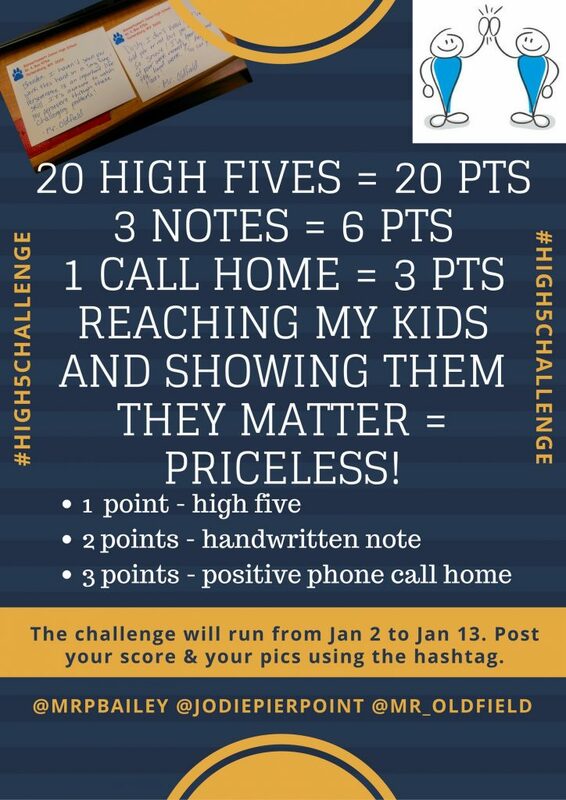 We have designed a challenge where educators keep track of “positivity points” daily by giving high fives, writing handwritten notes, or making positive phone calls home. We use the word points loosely because we will not be posting a leaderboard, giving away a million dollars, or any other award. The only reward given will be a smile on a kids face, the gift of being a champion for a kid, or joy from the happiness in a parent’s voice. Utilizing points will provide feedback for the participants to track if they are being positive throughout the school days. 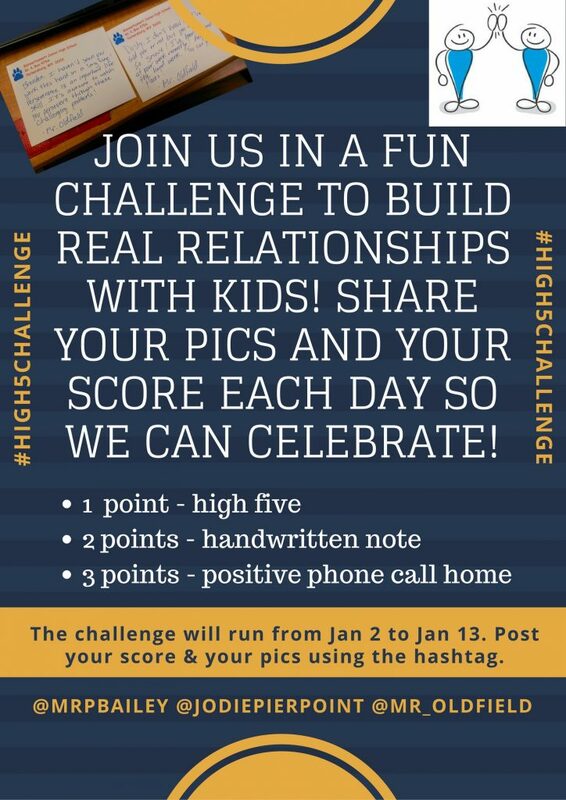 The hashtag #high5challenge can be used to post photos, point totals and/or goals and gain ideas of how others are promoting positivity within their buildings. We value the power in turning negative behavior through a simple high five or a sincere handwritten note. In a lot of ways, managing tough kids isn’t hard, it just requires effort that few people are willing to put forth. Meeting that tough kid in the parking lot as they get off the bus in the morning, just to slap him five and tell him you’re glad he’s here, doesn’t require a PD session or a training day. These simple gestures send messages to kids and we believe every kid deserves to be recognized. This is not designed to be a competition among adults. It is set up to be an easy challenge for individuals to begin promoting positivity within their building. Fourteen points one day with a goal of twenty the next ultimately means there will be more positivity shared. However, individuals are not to be discouraged if a colleague earns fifty points in a day. Together 64 points (plus the points of other staff members in the building) of positivity were shared in one building on one day.